Public Service Announcement: Exercise Your Tubes! Exercise Your Tubes! Twenty Fat-Busting Exercises to Keep Those Glowing Envelopes in Shape!!! What I'm talking about is a little preventive maintenance. After owning a tube amp for a few years, have you ever had a few little crackling noises develop? I bought a used amp a while back that had a little crackle going on down down low in the background. Turning it around, I tapped around on the tubes with the eraser on a No.2 pencil until the crackle stopped... temporarily. But after a while it returned. Tapped again, gone. Ah-Hah! Now here's the deal: When a tube sits in an amp surrounded by air for a few years, oxidization forms and builds up on the tube contacts. This happens whether or not the amp is used, by the way. 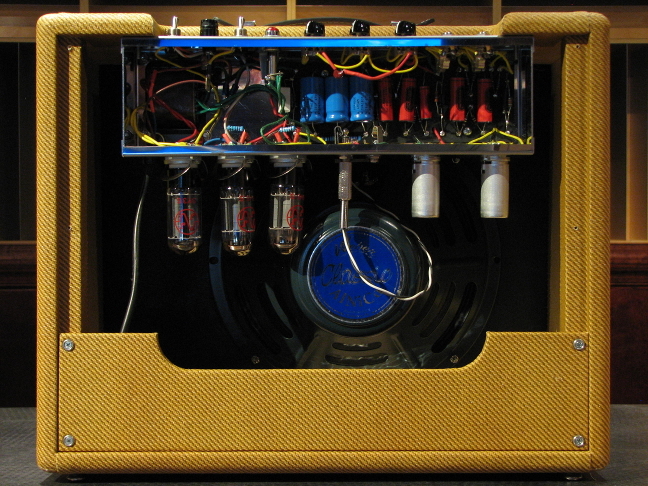 It is simply a little irritation from tube amplifiers. Some amps will exhibit this crackle as they warm up. Some will do it once they get good and warm. Some just chatter along all the time. The oxide buildup lowers the conductivity of the tube's contacts, sporadically limiting current flow. That, in fact, is what you are hearing. Eventually it can cause enough resistance that the current in the circuit will seek an easier path to ground, causing an arc at the socket and printing a carbon path that leads the current to ground and stops the functioning of the amp. Sometimes that carbon path can be cleaned off but sometimes you have to replace the socket. If not dealt with, the arcing might cause a larger failure. For a non-techie it can get expensive really quickly. But that crackling annoys me enough without the threat of further damage that I want to do this little procedure. But -gloriosky- there's a simple bit of preventive maintenance you can do to stop and remove the oxide build-up. The quickest way to get rid of the oxide on tubes is to "exercise" the lot of 'em. Turn off the amp, unplug it, and let everything cool down. Those tubes can get really hot. Don't ask how I know. Make a nice cup of coffee and play your guitar a little. Are they cool yet? 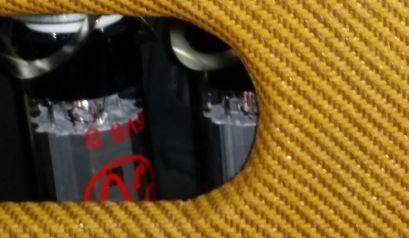 Ok, turn the amp around and get access to the tubes, whether that means pulling off the protective cage or removing the panel across the back. Now, one at a time, pull the tubes straight out. With the power and rectifier tubes, be sure to pull them out by grasping the base, not the glass, to keep from yanking the glass jar out of the base. I've got a lovely old 6V6GT power tube on display here at the studio. Someone ripped the glass envelope out of the base. I've stuffed it back in, but being displayed as a stuffed-and-mounted object lesson is all that tube is good for anymore. If you've got a can of Caig De-OxIt D5 lying about the house (and don't we all?) spray the contact pins on each tube the first time you pull it out, and clean the holes in the socket with a pipe cleaner sprayed with De-Oxit as well. Cover the handle end of the pipe cleaner with electrical tape to isolate you from the metal core before you start. If you don't happen to have De-Oxit laying around (and I was kidding) you can still do lots of good with the next step: Exercise the tube, carefully pushing it in and pulling it out a couple of times to scrape up the contacting edges a bit and provide a clean contact area. I did this with a Marshall amp yesterday. If you used De-Oxit, wipe away any excess liquid with an old t-shirt rag. In either case, insert the tube again and move on to the next. By the way, you don't have to wait until you hear crackles to perform this maintenance. 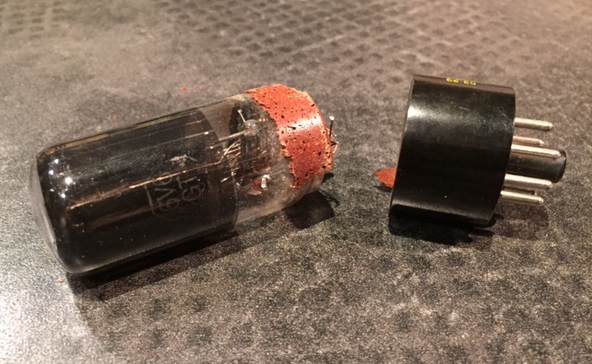 If your amp doesn't eat tubes, performing this maintenance once every few years is fine. Owners of some modern amps should take care to not be obsessive about this, though. 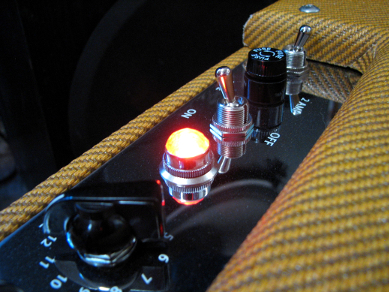 Less-expensive modern amps have their tube sockets mounted directly onto a circuit board in the amp. You can tell the difference between chassis-mounted sockets and circuit board-mounted sockets by the presence or absence of socket mounting screws adjacent to the sockets on the chassis. Presence of the screws means the sockets are rigidly chassis-mounted; absence means the sockets are circuit board-mounted. With circuit board-mounted sockets you can also see adjacent tubes flex when you press a tube back into its socket. Take care and don't over-do things with a board-mounted design. You can crack the board or some of the traces while fiddling aboot. Un-good. It's better to apply De-Oxit to the tube pins and brush with a toothbrush and use the pins to apply it to the sockets in this case. In the absence of De-Oxit, carefully run the tubes in and out a couple of times. When you are finished, replace the covers, fire up the amp again, and take a listen. Bet the crackle is gone. Voile'! So there you go: A five-minute job kills an annoyance, saves a pile o' cash, and earns you a well-deserved cup of delicious coffee in the process. Hmmm... And you didn't even have to change into a leotard, either.